Culzean Castle, dating from the 18th century, designed by Robert Adam, from the gardens, Ayrshire, Scotland. 10x8 Photograph (25x20cm) Culzean Castle from Robert Harding . Explore Culzean Castle with this book. Culzean Castle on the Ayrshire coast is the most visited property of the National Trust for Scotland. This lavishly illustrated book tells the whole history of the castle. Michael Moss has carried out extensive research, drawing on estate records, original plans and family correspondence to create a major new history of the castle and a fascinating account of the running of a Scottish country estate. With new pictures, many of them in colour, and an accessible style, this is essential reading for anyone interested in Scottish history and Scottish architecture. Built in the late sixteenth century above a network of caves, the castle became a centre for smuggling during the eighteenth century. Sir Thomas Kennedy, 9th Earl of Cassillis, went on an extended grand tour in the 1750s and returned full of ideas as to how to improve his vast estates and home. His brother and heir commissioned Robert Adam to create his masterpiece and became bankrupt as a result. The estate was rescued when wealthy American cousins inherited it in 1792. 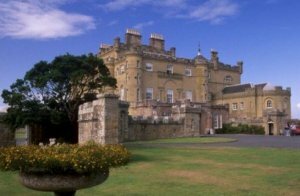 Archibald Kennedy, 1st Marquess of Ailsa, completed the house and lavished money on the property.Culzean Castle. The Magnificent Castle of Culzean and the Kennedy Family . Your personal Small Group Tours of Scotland may include, Aberdeen, Argyll, Arran, Culloden, Edinburgh, Glasgow, Glencoe, Isle of Skye, Loch Ness, Loch Lomond, St Andrews, Stirling, and much more.